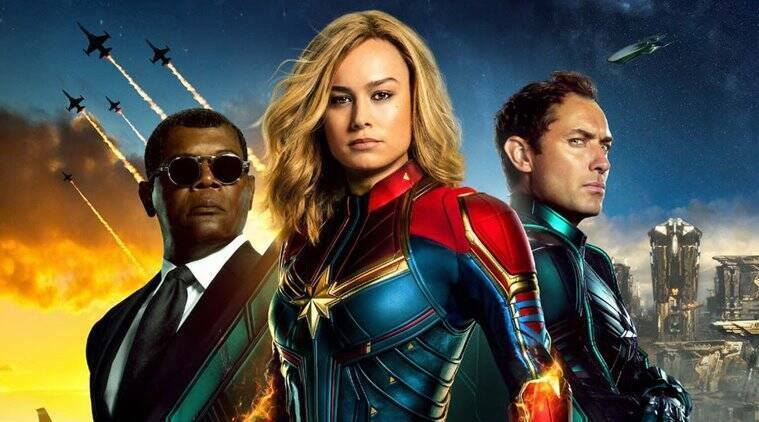 Samuel L Jackson's younger Nick Fury and Jude Law figure prominently on the poster on either side of Brie Larson's Carol Danvers. Captain Marvel is wearing the classic red and blue costume. The movie releases on March 8. Marvel has released a new international poster for Captain Marvel. The poster is pretty vibrant and shows all the important characters of the film. It also highlights the contrast between the superhero’s two identities apart from her original Carol Danvers one — as a member of Starforce and as Captain Marvel. Samuel L Jackson’s younger Nick Fury and Jude Law figure prominently on the poster on either side of Carol. Captain Marvel is wearing the classic red and blue costume. Carol’s teammates in Starforce, a team made up of alien warriors, also find a place in the poster. Minn-Erva (Gemma Chan), Att-Lass (Algenis Pérez Soto), Korath (Djimon Hounsou) and Bron-Char (Rune Temte), are all there. Between them is Carol in the Starforce’s green costume. Carol Danvers was a pilot before she found herself among the Kree, an extraterrestrial race. Her DNA was fused with that of a Kree’s and it gave her superpowers. At some point, she crashed back to earth, amnesiac about her memories as an earthling. She meets Nick Fury and together they fight the Skrulls, another extraterrestrial race known for its belligerence. Captain Marvel first found mention in the Marvel Cinematic Universe in Avengers: Infinity War’s post-credit scene. Nick Fury, just before disappearing like everybody else in Thanos’ purge, sent a distress signal to Captain Marvel. She is expected to join the Avengers in their fight against the Mad Titan.